Children should try a variety of sports and develop skills, such as swimming and the ability to hit and kick a ball. Lots of non–scheduled physical activity is great, too, such as playing in playgrounds. Encourage teenagers to keep one team sport, if possible. For teenagers who are not into team sports, swimming or athletics can be a good way to keep fitness levels up. You are at your absolute physical peak in your mid-20s, with the fastest reaction times and highest VO2 max – the maximum rate at which the body can pump oxygen to muscles. After this peak, your VO2 max decreases by up to 1% each year and your reaction time slows each year. The good news is that regular physical activity can slow this decline. Building lean muscle mass and bone density at this age helps you retain them in later years. Vary your training and keep it fun. Try tag rugby, rowing or boot camp. If you are a regular exerciser, get advice from an exercise professional to build “periodisation” into your training regime. This involves dividing your training regime into progressive cycles that manipulate different aspects of training – such as intensity, volume and type of exercise – to optimise your performance and ensure you peak for a planned exercise event, such as a triathlon. Work smart. Try high-intensity interval training. This is where bursts of high-intensity activity, up to 80% of your maximum heart rate, such as sprinting and cycling, are broken up with periods of lower-intensity exercise. This kind of workout is good for the time poor as it can be done in 20 minutes. For all women, and especially after childbirth, do pelvic floor exercises, sometimes known as Kegel exercises daily to help prevent incontinence. Diversify your exercise programme to keep it interesting. Try boot camp, spin class or yoga. Most people start to put on weight in their 40s. Resistance exercise is the best way to optimise calorie burning to counteract fat accumulation and reverse the loss of three to eight percent of muscle mass per decade. Ten weeks of resistance training could increase lean weight by 1.4kg, increase resting metabolic rate by 7% and decrease fat weight by 1.8kg. Try kettlebells or start a weight-training programme in your gym. Take up running, if you don’t run already, and don’t be afraid to start a more intensive exercise programme. 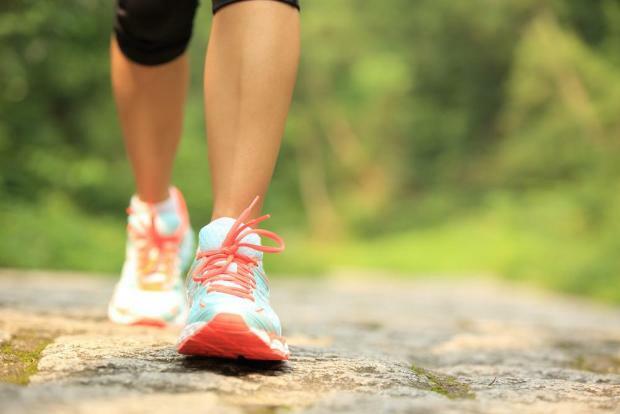 You get more bang for your buck with running versus walking. Pilates can be useful to build core strength to protect against back pain, which often starts in this decade. In this decade, aches and pains may crop up and chronic conditions, such as type 2 diabetes and cardiovascular disease, can manifest. As oestrogen declines in postmenopausal women, the risk of heart disease increases. Do strength training twice a week to maintain your muscle mass. Weight-bearing exercises, such as walking, is recommended. Walk fast enough so that your breathing rate increases and you break a sweat. Try something different. Tai chi can be excellent for balance and relaxation. Typically, people accumulate more chronic conditions as they get older, and ageing is a major risk factor for cancer. Maintaining a high level of physical activity can help prevent cancers, such as post-menopausal breast cancer, colon cancer and cancer of the womb, and it reduces the risk of developing chronic conditions, such as heart disease and type 2 diabetes. Try ballroom dancing or other forms of dancing; it’s a fun and sociable way to exercise. Incorporate strength and flexibility exercises twice a week. Aqua-aerobics can be a great way to develop strength using water as resistance. Maintain cardiovascular exercise, such as brisk walking. Walk and talk. Instead of inactive visits from family and friends, go for a walk together. It will keep you motivated and boost your health more than solitary exercise. Incorporate some strength, balance and cardiovascular exercise in your regime. But get advice from a physiotherapist or other exercise professional, especially if you have several chronic conditions.